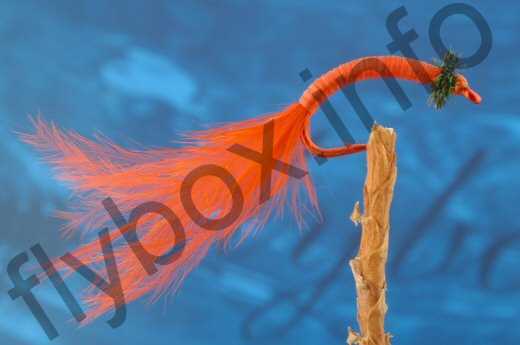 The Flexi Floss Bloodworm was created to represent the larva stage of the midge. They live buried in the mud but now and again come out to replenish their oxygen supplies, which is when the trout will feed on them avidly. Work the Bloodworm fly along the lower levels of the water using a gentle figure of eight retrieve and activating the marabou tail with little twitches to simulate the lashing swimming movement of the naturals. Thread : Fire orange 8/0. Tail : Small tuft of red marabou fibres. Body : Red flex floss, spanflex. Head : Two turn of bronze peacock herl. Bronze or red grub hook. Currently there are no comments about the Flexi Floss Bloodworm fly pattern from other fly fishermen yet.